January 2016 - More Thanks! Chrismas was a smashing success. It took a fantastic group of Santa's Elves working together to accomplish the task of providing a loving & memorable Christmas to 27 children at Sonshine Hacienda. What I'm really saying is that it could not have been accomplished without the help of our wonderful church, Mission San Felipe. For instance, Linda Ortiz headed up the “Christmas Stocking” project. Each child was picked by a church member and they filled their stocking with goodies and little toys. Then there was another team that was small but mighty. They wrapped all the presents for the children. This group worked like a well oiled machine. In just a couple of hours a mountain of presents were wrapped. And finally there were all the gifts that were purchased by money that was donated for our children. I would like to say thank you to all the families that purchased gifts for our children and donated money. Your generosity humbled and blessed us. 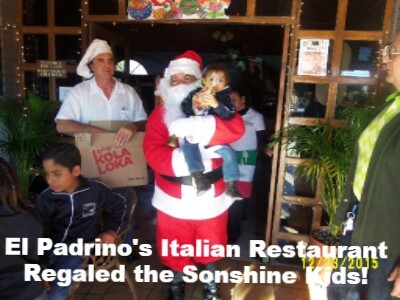 In addition to individual families, we also had many of our supporting churches, local restaurants, the local Police Department, the local hospital, and a youth group from San Jose, CA, who gave gifts, money, or time to make the Sonshine Hacienda Christmas so special. Again I have to say that it is truly humbling to see how the Lord touches the hearts of others to provide an amazing Christmas for 27 children who otherwise would have not had any Christmas at all. To all of you a great big thanks! If you're ever in San Felipe eat at this wonderful Restaurant! Owned and operated by a real Italian! Dr. Melina is a great dentist. Gary and Bob use her. If you're looking for a Mexican dentist, you've found her! For the past year we have been praying for some new washing machines. The machines we had purchased in the past were simply “beat up” due to the high volume of use that was required of our machines. So we began sharing with our supporters our need. We were down to one decent machine and that was very difficult with wash to do for 27 children.As the word spread, good news began to arrive. We received word from the Rotary Club in Rocklin, California: they would buy us a heavy duty washing machine, as well as a heavy duty dryer! Then soon after, we heard from the Lustigs, long time supporters of Sonshine Hacienda, who said they would purchase the second heavy duty Washing Machine! What a big "Praise the Lord!" this is. Washing machines and dryers that work! They are such a wonderful gift. Our dorm mothers and our housekeeper are so happy to see these new machines. We are going to have training classes on how to use the machines correctly before this newsletter hits your inbox! Do you have a large package or box to mail to us? Do you have a small package or letter to mail to us?